Here are some projects that we are working on. Progress is being made behind the scenes on several of our projects and you will be hearing more about them as things begin to happen. COURTNEY RAC GRANT PHASE I & PHASE II – (grants applied for through the Ottawa National Forest) Phase I completion may be old news to you, as the work and trial improvements are already done on FR 1841, the eastern edge of the trail system. Phase II has been scaled down considerably. This grant was for trail improvements and for a river crossing. It is now being considered that a river crossing will be funded by another source. We were able to purchase gravel for trail repairs to take place this summer. STEP GRANT – (provided by the American Quarter Horse Association and Tractor Supply) We still have $3,326.27 which will go toward future trail project goals . LOGGING ON THE COURTNEY EQ TRAILS & TRAIL SIGNS – Keep watch for logging on almost all of the trail system, with the exception of the loop that runs around the lake itself; Forest Roads 1841, 1986, and 1960. There will be a scant amount of logging there. To protect our resources we have had to remove most of the maps and signs from on the trails. A map with logging sale boundaries has been posted at the trail head, for your information. Note that loggers will be moving from one area of the trails to another. Please be courteous; if you notice active logging in any given location, do not ride there. Ride safe and enjoy. Also note that the trails may look quite different as the loggers manage their sales along upon the trials. Some roads may extend past the typical mapped areas. So you may want to bring a compass or GPS with you on the ride. We will be reposting maps and confidence markers as able, when loggers complete their jobs. It may take months or even a couple years before it is all done. Still the trails are open for you to enjoy. ONTONAGON COUNTY’s Recreation Area (plans are for both horse and ATV trails) This project is located on Himanka Road, south of Bruce Crossing. MI-TRALE will meet with the Ontonagon Planning Commission on that site soon, as the commissions works toward developing a family trails recreation area. PIKE LAKE CAMPING AND TRAIL PROPOSALS WITH “MDNR” – MI-TRALE has explored the area quite allot during 2017. The very supportive DNR staff have given us a map/print of suggested trails. We worked under a “Land Use Permit” in 2017 and have entered another such agreement for 2018, so we can search for more loops within the mapped area. If you want to join us, let me know. Our proposal is for designating trails, a parking area and more. This is exciting…and fun. CAMPING WITH HORSES You can always camp in the forest or along the forest roads, as a “disbursed camper”. Check out the Ottawa National Forest or DNR webs for info. Area Resorts; google them for locations and call them. There are many that are horse friendly. Some on lakes or rivers with firepits, etc. Check them out! STAY TUNED…WE ARE WORKING TO SUPPORT OPENING A DEVELOPED CAMPGROUND IN THE AREA THAT HAS AMENETIES AND ACCESS TO HORSE TRAILS…SOON!!! 2017 – Happy folks enjoyed a great gathering at the MI-TRALE “RIDE-IN 2017” – Stannard Township Park. The equestrian committee is hosting our 3rd annual RIDE-IN. We will meet at the the “Snow Valley Garage” just west of Trout Creek. ATVs and other motorized travelers will ride east to visit the Sturgeon River Wilderness area. Horses will ride west to the Agate Falls Trestle that crosses over the Ontonagon River. -1:00 pm enjoy specialty grilled hot dogs and brats. Side dishes and soft drinks will be provided. IF YOU ARE WONDERING HOW TO SHARE THE TRAILS WITH OTHERS, here is what we suggest: take it easy, keep speeds low, watch ahead and behind…expect to meet others, be safe, have fun and enjoy the encounters with others. “Yield” to others for safety and courtesy on the trails: ORV’s yield to all other users, bikers yield to hikers and horses, hikers yield to horses. Stopping, turning your engine off and “speaking” to horses will let them know that you are a person…and not a threat to their safety. At times they do not recognize helmets or machines, but they recognize people and feel safe with them. Please consider helping us out…We are small in number working for your enjoyment; making sure the trails are well maintained and safe. Any amount of help that you can offer, will make a difference. Call us!!! Thanks. Ride as often as you can…and there will be great memories to share about your time in the beautiful Upper Peninsula of Michigan. Share your stories and with us. It is always great to hear from you. COURTNEY RAC GRANT PHASE I – (a grant applied for through the Ottawa National Forest) This $7,000.00 grant repaired a few sizable waterholes and graded the area to improve your riding experience. The project will be finalized early this spring. COURTNEY RAC GRANT PHASE II – (a grant applied for through the Ottawa National Forest) $9,500 will be spent on improving access to the Firesteel River’s future non-motorized crossing and surrounding area. We wait a logging project to be completed before we can put these fund to work. This may take some time. We will keep you posted. STEP GRANT (provided by the American Quarter Horse Association and Tractor Supply) The $3875 grant was complimented by a $300 donation from MI-TRALE for a total of $4175. The goal of this grant was for education and trail repairs. Two years ago, MI-TRALE and the Ottawa National Forest teamed up to educate 265 children about invasive species. We designed and purchased signs which will be installed on the Courtney EQ Trails in the spring. These signs educate us about invasive Species, who yields to who, and trail etiquette. The $3,326.27 will go toward future project goals: signs along the highway with our trail name on them and more trail repairs. Since the logging project on the eastern side of the trail system is complete, we will be replacing the maps and confidence markers there. ONTONAGAN COUNTY’s MINAMKA HILL AREA FAMILY PARK – Both ATV and Equestrian Trails are a part of the plan. 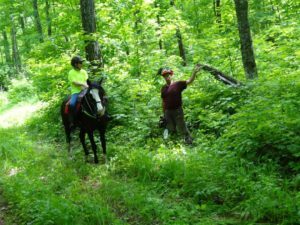 We hope to visit the area on horseback this summer to check it out and will offer our support and our help to Ontonagon County. EQUESTRIAN CAMPING and possibly more trailsThe MI-TRALE Equestrian Committee continues to work toward getting an equestrian campground in our area. The possibilities are there, so keep tuned. We are excited. One consideration is the Pike Lake area. Our DNR friends have given us some rough maps and suggestions and we hope to do some investigative riding there this summer. That should be fun. Maybe you would like to join us. EQUESTRIAN RIDES 2017 We have set riding dates throughout the summer. Places to be announced. Check us out on www.mi-trale.org or on face book. We will suggest that you RSVP, in case of any changes. There is often the option of meeting for a meal at local businesses after our ride. Dates are: May 26, June 7 & 23, July 3 & 16 (a special event), Aug 9 & 28, Sept 14 & 23, Oct 11. The Equestrian Committee will be hosting this special event on Sunday July 16th at the Stannard Township Park in Bruce Crossing. This is our 2nd annual “Ride-In” and we are really looking forward to it. 10AM – Either ride in from wherever you are…or join up at the fairgrounds and hit the trails with your MI-TRALE friends. We will be there with horses and ORV’s… sharing trails and the fun. NOON – Specialty grilled dogs and brats with other great sides and beverages will be served. You are in for a treat. MI-TRALE supports all trail enthusiasts. If you are wondering how to share the trails with others, here is what we suggest: take it easy, keep speeds low, watch ahead and behind…expect to meet others, be safe, have fun and enjoy the encounters with others. “Yield” to others for safety and courtesy on the trails: ORV’s yield to all other users, bikers yield to hikers and horses, hikers yield to horses. Stopping, turning your engine off and “speaking” to horses and riders will help a skittish horse to see you as a friend. We will gather at the back of the park near the horse shoe pits and the small pavilion. If you want to play horseshoes…you need to bring your own. Sorry, but my horse rides bare feet. Consider the March 10-12th Michigan Horse Expo. A MDNR EQ Trails Subcommittee meetings is planned for the same time and some of us will be going. Some of you are receiving this MI-TRALE Newsletter for the first time. For the past 11 years I managed a private list of email contacts that I call “Friends of Courtney”, to whom I have been sent equestrian news from our area. Recently I chose to offer these folks a chance to be on our MI-TRALE’s mailing list. You will find the same updates and EQ news here. You will have a chance to learn more about the many aspects of our projects and this wonderful group of volunteers. We welcome you!!! It is inspiring to be a part of this group’s energy and comradery. We appreciate you and we hope you will consider joining us for some fun. If you want to become more involved please consider becoming a member. And, we can always use more hands on the trails. In fact, I will say…we need more hands on the ground. We have allot to offer trail enthusiasts and bringing enjoyment to others is our reward. Have a great day! Have a great ride! -Cathy prepared a letter addressed to USDA Finance Office in Albaquerque to seek reimbursement for $650, and sent it to Don along with Mr Lukkari’s invoice and before & after pictures. Don will submit the request. -Deadline for spending the remaining $190 is May 31, 2017. -wait for the FS to install the river crossing, an artificial river base per the plans shared with us. -Actual RAC fund project will be used for road within the trail system that need repairs; likely those leading down to the river on both north and south banks. It may also include motorized vehicle barriers. We have discussed various designs with the FS. 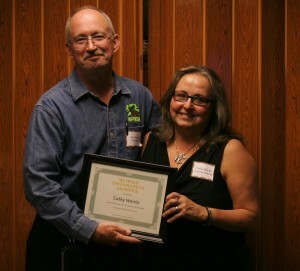 -Cathy will submit the annual project report to Don on this grant as well. -install them in the spring with the FS and MI-TRALE news announcement/article. -Cathy will draft a letter to the County Planners to give input on the name of the park, (we recall how their survey called it an “Offroad ORV Park”). The name should reflect all trail users or no user. We would also like to offer our support and offer our help with equestrian planning. We will review the draft together. COURTNEY CAMPGROUND – SEEKING TO OPEN IT TO EQUESTRIANS. -MI-TRALE LETTER: the Committee edited MI-TRALE’s letter. We are determining if the DNR’s letter will be sent as an attachment to ours, and Linda will then send it to Susanne Adams. -FUTURE CONSIDERATIONS: We may suggest some improvements such as a turn-around loop for large rigs and certain campsites that are more favorable for large rigs and horses and access to the trails. -Will we need to garner support from the Caretake or others? The FS will be doing a public review. -2 or 3 sites in the spring with a fire ring. Maybe more later. There are trail/route possibilities to investigate. -We have sent our suggestion to Rich P. Twin Lakes Park Manager and Jamie M. MDNR Unit Supervisor, to set up the fire rings and picnic table in the spring. We suggested that we would ride horses in the area to check out riding routes. Rich had been talking to the Forestry Division asking about trail development, marking and mapping trails. He will visit a MI-TRALE meeting and update us. -DNR currently has no plans, policies, funding for EQ projects alone, that we are aware of. We have no project to fund at this time. So there is no immediate need to research funding. -Cathy contacted the developers suggesting that they need easements from the DNR to access trails. They had more questions. Janet as MDNR EQ Trail Subcommittee UP Rep, will contact DNR for them. 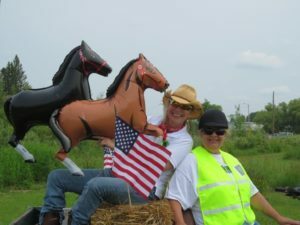 – July 16th the MI-TRALE “Ride In – Joint User Ride” Cathy will contact Stannard Township to see if horses are allowed in the park. If not we may opt to ride the LL and eat at the Running Bear Resort. -We may opt out of this event. We may camp at Pike Lake and ride to investigate riding routes in the area. -We discussed updates to the web and Linda has done them. She is not able to add tabs as of yet. Janet prepared a up about Geocaching. -South of Courtney, Cathy & Janet have ridden and can come up with suggestions. We are having some wonderful beautiful fall weather. Crisp cool air, a warming sun and beautiful foliage color. What a pleasure. I really appreciate living in the Upper Peninsula of Michigan with it’s “four seasons”. The summer flew by. I look forward to a few more rides on grass and leaves, and I am looking forward to winter riding on my new horse. As the summer winds down, we are busy with finalizing our trail projects. 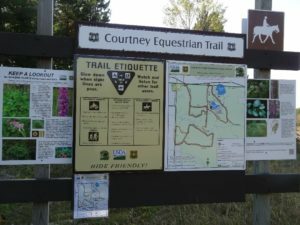 New signs have arrived for the Courtney Equestrian Trails; invasive species, trail etiquette and trail courtesy yield signs. We hope to have them installed in the spring. They are the beginning our MI-TRALE’s overall goal of helping trail users to understand how to safely share the trails and enjoy encounters with any and all trail users. The Courtney EQ Trails are shared with ATV’rs and hikers, so these signs include instruction and yield signs for these user types. The invasive species sign will help us to identify and report findings to the Ottawa National Forest. Invasives seem harmless, until they “grow” into a larger problem. So noticing and removing them early is a good idea. The Forest Service’s Pori Projects are actively improving the forest. We appreciate the care they are taking for vegetation, fish and wildlife. One logging project is complete and has left great improvements for the trails. Two future logging projects will do the same. We will do our best to keep tabs on them and post signs at the trail head, so you know what to expect. We are managing three grants for trail improvements. One will help pay for the signs mentioned above and on future trail needs. A second grant has a small amount of remaining funds which we expected to be spent yet this fall on trail maintenance and repairs on one of three locations. Other grant funds will be spent on or near the future river crossing. We have told you about a proposed Equestrian friendly campground on DNR property near the Courtney EQ Trails. There are new thoughts on this. One of which is that large rigs may have problems because of the sandy ground. So, alternate locations are being considered. This may bring us new opportunities to ride and enjoy more trails. I am looking forward to investigating the possibilities with our DNR friends. Next summer we will catch up with Ontonagon County and the Himanka Hill area’s “Family off Road Riding Facility”, where both ATV and Horse trails are being proposed. Again there is logging going on there, which will enhances trail possibilities. It is an area with small rolling hills and the proposal will offer a nice place for disbursed camping and riding. We are looking forward to this project also. On a personal note, my older horse that has befriended me on the trails, camping and in parades, is not able to make the miles anymore. So, Babe and I have welcomed a new horse Cheyenne, into the barn. These two mares are great medicine for me. They greet me and follow me. They welcome chickens into their stalls and pasture, and believe it or not they both enjoy petting the barn cat with their lips, and they don’t mind my crazy overactive dog. Horses are gentle giants…one of God’s best, I think. Let’s talk a bit about volunteering. We look for and appreciate your input and any help you offer. There are only a few of us who are spreading ourselves too thin. It is often the case that 90 percent of our free time spent on the trails are not enjoyed in our chosen recreation, but power sawing, shoveling, clearing brush and posting signs. This is actually how some volunteers spend their vacation; working for others. Please ask yourself; can you help out? Thanks much! And remember why we do it…so you and others can enjoy the trails. June 21st was the first day of summer, the longest day of the year. The days are already getting shorter. So folks, you might want to get out there and enjoy your summer recreations before the white stuff flies. The equestrian committee is tracking or working on several projects, some old and some new. Courtney Equestrian Trails maintenance is ongoing. We have been out there twice this summer so far. Once by truck and once by horse. Though we can cover more ground in a vehicle, there is an advantage to the “Working Horse Rides”. From the saddle, we can reach pretty high. We keep nippers in saddle bags to trim branches and brush from around signs. Our horses are “sacked out”. In case you don’t know what that means, I will explain. Horses are generally claustrophobic and a bit skittish, as prey animals are. The instinctive nature of a horse is to always be positioned to flee from possible threats. For the most part they are afraid of almost everything until they get familiar with it and no longer consider it a threat: like a branch falling on them from above for example. So, for a horse to be willing to ride into tight brush, up against trees, straddling logs with sticks poking and pushing against them from all sides and stand still while a rider twists and turns upon them and drops branches, and drags them around: it is a nice accomplishment. We are planning a work day to adjust confidence markers. Some are getting tight on the trees, and need to be loosened. There are a few trees down and some brushing to do and maps to repost. The logging project on the easternmost trails will likely be done in the fall. The trails are much improved because of their work. As a part of the Pori Junction Vegetation Management Project, more logging will be done near and among the trails beginning in 2017 & 2018. We look forward to the improvements they will bring. Signs that will be installed, possibly before the end of the summer will include: invasive species, shared trail etiquette and yield signs. The yield signs will have iconic pictures of three main trail users; horse, atv, and hikers. Arrows show who yields to who. We are waiting for drafts from the designer. The new MI-TRALE Trail Guide is now available. We are excited. It is better than ever and will feature both a book and a folding map. For the equestrian, we have included several suggested rides, information and web addressed for planning your campout. AND…there is an updated map for The Courtney Equestrian. You will find it in the book and you can find a direct link to it on the MI-TRALE web. Many thanks to the Ottawa National Forest, who worked to bring you a great map. Please call and let me know if you are interested in being added to our email list of Courtney Friends. We need some help on the trails and we would like to include you when we announce our rides. The equestrian Committee is sponsoring two special rides this summer. “The Ride In” will be on August 13th on the trials near the Ontonagon County Fair Grounds in Greenland. This will be for any and all user types to “ride in” an join us for a picnic meal. The annual Camp-n- Ride date will be announced. We plan to mix it up and ride a new location. How about on the shore of Lake Superior? Again, I will say we would appreciate new hands on the trails. We need your help. We enjoy working out there and think you would too. Call or email me and I will include you in our announcements. Take your saddle off the rack and get it on your horses back. Enjoy the trails. That is our reward. November 2015 – EQ News – for horse lovers and friends. We MI- TRALE equestrians have had a fantastic summer. We might say it went by too fast, but in fact we enjoyed a very long fall season which gave a chance for more beautiful color rides this season. For me personally there were two highlights of this year’s rides; one was a ride on the shore and into Lake Superior on horseback and the other was our Fall Camp-n-Ride, when we rode the Bill Nicholls Multiuse Trail in Ontonagon County, over three railroad trestles. Each trestle rises 100 feet over meandering tributaries of the Firesteel River. The company could not have been better and the colors were amazing. As this story goes, it was a first for many horses and riders; this “Three Trestle Ride”. The October air was brisk and cool, yet refreshing. Amid the conversations I heard comments about the beautiful views and the colors. Voices encouraging and thanking the horse. I heard laughter and silence. I heard the pleasant sound of the hooves of many horses, clomping upon the wooden planks or plodding upon rubber. It was a sound from the past and from the present, echoing off of time. It made me a part of something bigger than myself. There was strength in it. I heard the words “bucket list.” The experience was both exciting and calming. We stopped along the way to take pictures, rest and graze. Typically, there were question and answer sessions about each other’s horses. We had the pleasure of visiting fellow trail enthusiasts who rode ATV’s. Afterwards, we ate dinner at a local restaurant, shared some great pictures and talked about “the next ride”. People “friended” each other, and I’m certain it was not just about facebook. There are motorized trails and there are non-motorized trails and believe it or not, all across the country there are trails that have both. Some people see this as controversial, others simply “share”. You might ask: “How does that work for horse and rider. Well, it can be a problem. My belief is that “no one person is more important than another”. 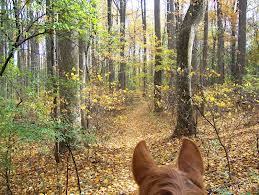 Horses and riders and others need to be ready to share the trails. 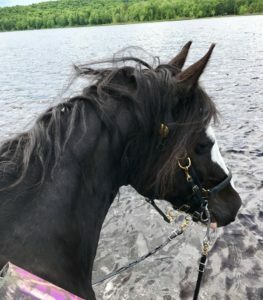 Horses to some degree can be sacked out, or desensitized through training exercises that help them get used to and unafraid of such surroundings. A person might say that horse riders need to be responsible to control their horses in such an environment. I have said it. But, they need help from other trail users. Why? Because though horses are gentle giants, athletes and enjoy a partnership with the rider; they are prey animals and by instinct can become afraid of things very quickly, expecting that they might be killed. I have repeated this old saying many times “Horses are only afraid of two things; everything that moves and everything that doesn’t”. Their instinct is to flee a predator, much like a deer. Think about riding a deer who is being chased by a predator, and how dangerous that could be. How long do you think you could “stay on”? And then think of how peaceful and pleasant it would be if you could befriend a deer, harness it and have it carry you through the wilderness. MI-TRALE is a Multi-User Group and we want everyone to enjoy their experiences on the trails. This summer we explored multiuse trails in the area on horseback and met a lot of very kind motorized users. We were encouraged by the courtesy and friendliness shown and the kind interest about our horses being there. They took pictures and videos of the horses. There were smiles all around. Yet, there were a couple of them who did not slow down, and without realizing it, they caused a potentially harmful situation. Janet Miesbauer, our publicist recently posted a “Shared Trail Etiquette Standard” on our Facebook page that would help educate us. Let’s be safe out there! Janet and I have scouted out some riding areas this summer, and we are not done. We look forward to do more before “the white stuff” flies…and maybe even when it does. We would like to map and mark those trails for your convenience. Do you want more trails to enjoy and to invite others to? We would appreciate any help that you can offer: suggestions of other places to ride or establish trails, help maintaining trails, spotting trail issues and needed maintenance. Any input is appreciated. We will meet with the Forest Service sometime this month to discuss timeframes of various projects on or near the Courtney EQ Trails…including the long waited “River Crossing”. We cannot wait to make that announcement! We wait to hear from the MDNR about the proposed EQ/Multiuse campground. We expect to receive a layout of the proposal to review with them. Earlier this month, MI- TRALE was invited to participate in a forum to help plan how to promote Michigan’s Tourism. We live in an amazing and beautiful place; a vacation in the backyard. If you manage or know of any events that you would like to have listed on the State of Michigan’s Pure Michigan web, please let us know. We can get you in touch with the people who are working to promote Horse related fun in Michigan. Remember, Janet is on the Michigan Dept. of Natural Resources EQ Trails Subcommittee. She is our voice. (Contact info below). As always, I hope to meet you on the trails. Hope you have a great time whatever you do. Here we are; mucked out, trailers ready to hitch, truck tuned up, horses shed out and brushed (horse hair cleaned out of our teeth), tack haybags and buckets ready to load…grass greening up real nice…and it is snowing today!!! !…but melting as soon as it hits the ground. If you are up to snuff on these things you are doing great. If not, you may want to start checking things off “the list”, because…we are getting ready to ride and camp out. Pass the word, we would love to have you join us. We have set 2 days each month as target dates. We would like to propose a camp out at the Ontonagon Township Park on Lake Superior…(YES on Lake Superior)…, where EQ camping has recently been set up. A huge thanks to those recreational planners. I am excited about this, are you? If anyone is interested in any or all of the rides, RSVP us. I will put you on a “MI-TRALE EQ Ride List”…and keep you updated. If you have a favorite location to ride and want to include it in our schedule, please let us know. Sat May 16, Tues May 26, Thurs June 11, Sat June 27, Sat July 11, Fri July 24, Mon Aug 17, Sat Aug 29, Fri Sept 18, Sat Sept 26. Beyond the joy of riding together, we have an objective; to become familiar with and help the DNR to promote the EQ trails in our area. We have a goal to work with the DNR, and suggest we help to map and sign them and get them on the DNR web site. 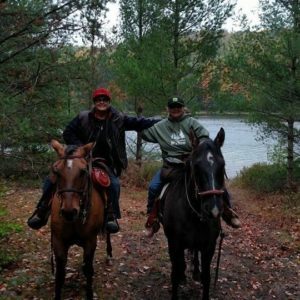 Some of the DNR trails to ride: Bill Nicholls Route, Ottawa East Connector Route, Sidnaw-Bergland Route and Iron River-Marenisco Route. We also plan to ride prospective future trails south of Bruce Crossing. Again, this is a part of your fun and a part of helping to promote EQ opportunities in the Western U.P. A reminder, we maintain these trails via our maintenance agreement with the Ottawa National Forest, supporting each other in trail improvements and projects. If you would like to join the team, you can visit MI-Trale.org for a membership application. If you would like to help for just “the day” at any of our work bees, you can simply sign a FREE day membership form offered on site by MI-Trale. Trails are groomed and maps are posted. There is still logging activity on trails south/east of the lake, which limits riding in that area. YEAH….a river crossing is not just being talked about, but IN THE PLANS. MI-Trale has significant grant funds to repair the ground and post more signage in the future. Suggested; shared trail etiquette, invasive species, and highway signage. MI-Trale is now an official Geocaching member; Visit GEOCACHING.COM. We have stashed Geocaches on the Courtney EQ Trails and there are plans to do the same on the ORV “Pioneer Trail”. We had fun putting them in place. We hope you have fun searching for them!!! MI-Trale with allot of public support, proposed this camp ground some time ago. The DNR has been reviewing it. The proposal is to have equestrian sites available yet to have a camp ground which will be open to the general public. MI-Trale plans to “partner-up” with the DNR and offer help throughout the proposed project. There are other great roads to ride in the area, north of Highway M-38, on DNR managed property. We welcome any comments, concerns about the trail conditions and of course, your help. Our meetings are open to the public on the first Monday of each month. On a personal note, I have been told to ride my horse more, so I can keep up. Yes…that is the plan. Hope to see you this summer. Wishing you all the best. Some good information was gained during our February 24th meeting with several key people from the Ontonagon Ranger station / Ottawa National Forest. Here is some insight on our Equestrian projects. This is the “Water Hole” $5,000.00 grant of which there is still $840 left to spend. It was the consensus that it would be spent on trail heads. Unexpected delays occurred which prevents us from spending it before the May 2015 deadline. The ONF will seek an extension of this grant fund through May of 2018. This project was tied in with a logging project and resulted, unexpectedly so, in a closed gate blocking off a part of our EQ trail on Forest Road 1841. I was told by FS some time ago, that it was intended to block motorized traffic during the logging project and that we can propose to change it in the future…perhaps with a specialized style that will allow non-motorized traffic to pass. There is still the possibility of needing to level parts of the trail and haul in some sand or fine gravel to complete the “water hole” project. NOTE: An additional $2,000.00 in RAC funds was offered to MI-TRALE’s Courtney EQ Trails. I am not sure where this will be spent…possibly on a trail heads. The amount of $9,500.00 is mainly for river bank remediation’s to repair ATV use damage. An illegal plank crossing will be removed and ATV traffic re-directed. This ties in with the PORI project. This is a project strictly managed by the Ottawa National Forest, which involves logging, road use decisions, stream and river repairs and recreational enhancements, to name a few things. Engineering Evaluations are scheduled for this year. A “hard surface” river crossing is expected to be in place during F/Y 2016. A shared trail head (for horses and cross-country skiers) is also a part of the final outcome of this project. We have fund remaining for trail repairs and a culvert and signage. We wait advice from the Forest Service as to when those repairs can be done. The PORI project may play into this also. Janet is working with our partners in the ONF Environmental, on Invasive Species signs. We have other signs to consider: shared trail head, shared trail etiquette, and MDOT signage on the highway. Regarding youth involvement at work bees: we felt there was interest. News articles brought no response. We still have a couple leads on interested groups, and will possible pursue them in the spring. This will not cost us anything, but will lend to our in-kind work. For all ONF projects considered, we will plan to hit the ground in the spring, to see first-hand how these projects and funds could complement each other. We expect that work on this project will happen soon. Not sure when MI-TRALE’s involvement will begin. This is a big deal…and I expect they have evaluated it and come to understand of exactly what they want. Their experts will be busy. I suggest when they are ready; MI-TRALE will meet with them and get advice as to what agreements or working relationship MI-TRALE will have with the DNR on this project. STEP GRANT: brought a spectrum of activity. In May with the help of the Forest Service we educated approximately 260 grade school kids by visiting the Ewen and Ontonagon Schools, and sponsoring a Field Trip at Courtney Lake where The Ottawa National Forest Botanists and Educators taught. The kids were provided snacks and water, tattoos, invasive species materials; tread lightly color books, and transportation. When we educate the young we foster hopes for a future of caring about the land, as well as good relationships and appreciation of our land managers. We are currently working with the Forest Service Botanist and others to create informative signage about invasive species. This too is geared toward public awareness. We are working with Mich. Dept. of Transportation, with a consideration of posting Trail Locator Signs on the highway near The Courtney Equestrian Trails. Plans to include Teen Youth at work bees on the trails will be approached again in 2015. RAC Grants: These grants have been around for some time now. We have been tracking progress of our work, but for much of 2014, things have been at a standstill. We have funds set aside for: clearing brush, repairing low wet areas, trail head areas and the river bank. Much of this work will be done in conjunction with other Forest Service projects pending. We will be made aware of when the work will take place. We will keep you posted. 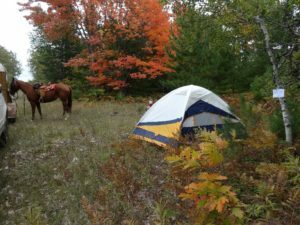 Equestrian (and other user) Camp Ground Proposal: MI-TRALE has been successful in bringing this proposal to The Michigan Department of Natural Resources (MDNR). We have stayed in contact with them about the process and progress and some minor changes for the proposal. For example, the DNR suggested an alternate location; set back from the highway a bit and in an old abandoned sand pit. It seems perfect. The news is encouraging and we expect to hear from this month, on what we can work toward. 2014 Camp-n-Ride: The turnout was scant, but the ride was great. Once again, the weather sent us home early. Possible Recreational Park in Ontonagon County: MI-TRALE is working with Ontonagon County on another possibility; a family recreation park on the south end of the county. The idea is to have shared multiuser trails contained within a specific acreage plot with a designated area for camp sites. The trails wind among small hills, which make the ride relaxed and interesting. It is quite enjoyable and peaceful. Geocaching on ATV and EQ trails: Our committee is planning for 2015. We have: collected cache items and containers, sighted locations or areas to stash, set up meetings in Dec and Jan 2015 to pack caches and work on details. We will decide who will manage and maintain each cache, what web or downloads we will work with and who will Chair the committee. Janet Miesbauer has offered to track coordinates for all the MI-TRALE Geocaches. Logging on The Courtney EQ Trails: There is still logging activity out there. Ride safe. Sharing The Courtney EQ Trails: Anyone who uses those trails are aware of the winter use by cross country skiers. I believe the snow is too deep for horse rides out there, now. But, I have been reminded that we need to please respect their grooming. They work hard to be able to ski out there. We also know that most of those trails are actually “Forest Service Roads”, open to various other users. We appreciate the shared courtesy that has been displayed out on the trails. Yet, we are also reminded to stay on the trails. There have been neighboring property owners who have found horse tracks and garbage on their property, Thanks. MI-TRALE GUIDE BOOK: Remember, the new Trails Guide has a fantastic map of Courtney and other great information about recreational trails (including water trails), amenities and popular site locations. APPRECIATION: We appreciate your support and interest in MI-TRALE. We share a passion for wilderness recreation and preserving its beauty. We work with some great people and enjoy good working relationships among our partners and constituents. We enjoy helping others to find their way into the wilderness, while preserving the trails for public use. I am looking forward to more work and fun next year. Have a blessed Christmas Season and a Happy New Year. MI-TRALE’s STEP Grant Committee will be meeting soon to tie up loose ends on the Grade School Educational Events that took place the end of May. We all learned about Tread Lightly Principles and Invasive Species. What an exciting and fun time to work with the Forest Service, teachers in the Ewen and Ontonagon schools and the kids. Also, as a part of the grant we will begin plans involving teens, to work with MI-TRALE on the trails south of the Firesteel River. MI-TRALE hopes to save important sections of the equestrian trails from erosion, bringing them back to safe trail standards. A low lying area needs brushing and a culvert replacement (mostly south of the Firesteel River). The trails need improved access to inlets and trail head, trail location signs and educational signs; Invasive Species, Tread Lightly and Leave no Trace. The STEP Grant trail work has begun. One Sunday in July between the rain drops; a few of us from MI-TRALE worked on the northern most inlet to the trails off of Dishneau Road. Prior to that Janet Miesbauer worked on other areas south of the Firesteel. This work was related to the grant’s goals and will be recorded as part of MI-TRALE’s in-kind work requirements. We are planning to improve our Equestrian Trail Awareness and help protect the land by installing new signage at The Courtney Equestrian Trails: 1) Trail Location Signs on Hwy M-38, 2) Invasive Species Signs, specifically so we “Trail Buffs” can watch for invasive’s and do our part the get rid of them, 3) Share the Trails Signs –important for safety and considering respect among users on Multi-Use Trails. There is still logging going on in that area, so please use caution. Monday Sept. 8th 2:30pm, work bee from horse back- to check & repost signs/maps, do a little brushing and take notes for trail work. Sunday Sept. 14th 2:30 pm, work bee from ATV or Truck to clear trails. Saturday – Sunday SEPT. 20 & 21ST. The “2014 CAMP-N-RIDE” at the Courtney Equestrian Trails. Visit www.mi-trale.org/horse-trails/area-events/ for more information. Work Bees – We will meet at the Courtney Trailhead on HWY M-38. In case of inclement weather, she will let you know of any changes in the rides. Additional work bees & rides will be announced throughout the year. Even if you cannot work on the trails, you could ride along. And please let MI-TRALE know if you find a problem or work that needs to be done. I welcome anyone to contact me as needed. For those of you who cannot join us to work on the trails, but have input about trail needs or you would like to comment on trail issues, we would like to hear from you. Your input is important to us. There are a few exciting newsworthy items to tell you about. We are going to be busy at the table on Courtney EQ Trail projects and more. Before I say more. We have so many to thank and you have heard me say it before. The Forest Service is very supportive. Without them, we would not have the Courtney EQ Trails. Without them there would be no improvements out there. And I will just say that some improvements are yet to be seen. Thanks too too MI-TRALE volunteers. 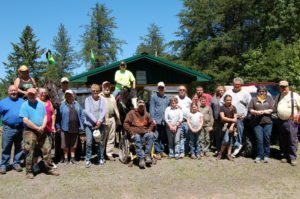 Their work and support make things happen, including keeping the trails ready for you to enjoy. The water holes are repaired, up to “road” specs. We will next be improving the ground to make it better for horses to travel. Currently there is pit run in place, so the going is a bit rough. In the spring we will work on completing the trail repairs. We are excited to say that we got the grant. It it called the STEP grant offered by AQHA and Tractor Supply. Funds will be used to put in a new culvert as well as improve ground in couple low lying areas. The grant will also involve and educate the area’s youth. We hope to bring in some upper grade age people to actually help on the trail work. We plan to offer educational presentations for the lower grades and have them participate in poster or other projects as a part of helping them to learn to care for the land and how to do it. You will be hearing more about this small grant. And we have been welcomed by AQHA to apply for more as our projects continue. What a great find. On Oct 23, Janet Miesbauer and I attending a public meeting offered by the DNR in Marquette. We are learning how to make proposals to the DNR for trails and more. On Oct 29, several supporters from MI-TRALE, the public, the Forest Service and DNR met on the SIMAR Landing Strip and continued our meeting indoors in Greenland. There we gathered input on some a possible EQ camp ground on the SIMAR Landing Strip. The MI-TRALE Board will be discussing the proposal at the regular meeting on November 4th. On December 7, 1pm at the Pit Stop in Greenland we will be gathering with anyone interested, to review plans for our projects and proposals. If you want any input or to just get together and talk horse stuff…this should be an enjoyable meeting. I did not go, as it was a cold of and on rain all day at my house. But I understand that others did have beautiful weather at the Courtney EQ Trails, and had a great time. Glad for them. This has been a big year where things are falling into place, and there is growing involvement from our horse community. Many Thanks. If I do any winter riding, I will let you know. Have a great time, whatever you do. I am canceling the Camp-n-Ride, in that I will not commit to being there to set up a camp for us. I camped last year in the snow, but I cannot imagine anyone committing to riding and camping in the cold rain. The Trail Head area is ribboned off and reserved for anyone who wants to rough it in the rain. Instead, we can leave it at this: if you want to be there, others may show up and join you. I may be there at 1pm for the ride. If the weather is half way decent tomorrow eve, I may show up with some firewood, and may choose to stay and sleep in the truck. A little easier then a wet tent. If I stay for the night, I have a small cake and chips to share. The percent chance of rain for Sat is a little less than tomorrow….just saying. Here is the schedule we had set, in case some of you want to make a last minute run to the trails over the next couple of days. RIDES & SUCH (set at EST) :Friday 1pm – Ride / 5pm-ish eat (bring your own meat & beverage and a dish to share) / Evening ride anyone? Saturday 11am – Ride / 2pm-ish Late Lunch / Packing up? or ride some more? WORK BEE SUCCESS: On Wednesday, we made sure the trails North of the Firesteel are ready for you. The trails south of the river were not completely tended to, but most of them are in fairly open areas, so you should be ok. All we did there, was to make sure the two entries off of Dishneau Road have maps posted and are well marked. The first entry is approx 1.7 miles from Hwy M-38 and the second entry is approx 3.2 mi from the highway. The second entry is the most likely to have clear passage onto the trails. We did not check the other one. We ran out of time. As you may know, there is scant parking there. LOGGING PROJECT INFO: The area which contained the waterholes is now repaired to engage logging trucks. There is currently pit run on that stretch of trails and I would not take my horse on it. There will be improvements made there later to accommodate horses. If the loggers are not there and you wish to ride that area, you may want to use a detour (not really a part of the trail system, but used by many). This detour runs in a loop toward the east, beginning just on the north side of the former waterhole area and ends up on the south side of it. Many of you have avoided the water holes by taking that detour. You will also find large rooted stumps blocking the trail where it intersects with the hiking trail, which a distance north of the former waterholes. You will have to “woods it” a bit to get around it. The rest of the ground out there is excellent for a ride. Use caution please. Sad to say, with the govt shut down, the Forest Service will not be able to join us. Hoping for a quick resolve. No one responded about wanting to extend the work bee into the evening, so I assume we will be working from 10am to approx 2pm. The ski trail groomers did not get back to me. I have made new laminated maps for each of the “you are here” signs, with locations already indicated. I have also made “Reserved” signs to place at the trail head…for Oct 4-5 Camp-n-Ride. If anyone has ribbon, please consider bringing it. I have a short supply. I will look to buy some on my way out. In prep for horse and riders coming out this weekend, I have made 4 signs: “CONSIDER SAFETY – LOGGING PROJECT AHEAD ON FOREST ROAD #1841”. Those we can place on the trails ahead of the logging location. I want to check out the water hole repairs, and enjoy the beautiful fall colors. I am bringing a camera. With Don and/or Mike there, I could pick up a chainsaw, so will bring my chaps in case. I will definitely bring loppers, and gloves. Please email or call me #988-2232, if you plan to join us. I don’t want to leave the trail head without you, as there is scant cell reception out there. WORK BEE: We have scheduled a Work Bee at the Courtney EQ Trails for Wednesday Oct 2nd 10am through ???? The plan is to have chain saw work complete in the am and if any work needs doing, we may extend the work bee into the early evening for people who might want to join us then. For that, I would need to know if anyone plans to be there any time after 3pm. The Forest Service will bring their chain saws. MI-TRALE and other volunteers will be there. Will you join us? Bring water, eats, gloves, nippers, safety stuff, etc. We will be working from ATVs or trucks. Relax or Run! Enjoy yourself! Enjoy others! Enjoy the trails and the great outdoors! The “Trail head” area will be reserved for us. Thank Forest Service! A couple of us plan to camp at or near the trail head; will be on site to set up camp around 11am on fri. There is room for several rigs there. I will bring firewood, rocks and a grid for cooking, and share the fire with anyone who comes along. I will bring a folding table for us to use. I will throw my guitar on board, just in case someone wants to sing a cattle call. Nothing “fancy-schmancy” needed. Bring your camper, if you wish. No hookups available. I will be in a tent. Others plan to sleep in their rigs. I tie Babe to the horse trailer. Bring highline equipment if you wish. If you plan to camp on the Ottawa, (and if the Trail Head area is full)…there are locations at and near the Trail Head on Forest Road 1980 that would be easy to drive to. You can camp anywhere you wish. Use your own judgment, or let me know and I can offer some suggestions. If you camp on the Simar Landing strip or on the north side of the highway, on DNR property, you need to contact the DNR for permits. PARKING: The Simar Landing Strip across Hwy M-38, from the trail head, can be used for “Day Use and Day Parking”. I will set out my Road Side “Horse and Rider” signs. LATRINE: The latrine at the “day use area” on Courtney Lake is open. We can ride horses in to that area but not onto the developed camping area. DRINKING WATER: If the spigot is “on” near the day use area, that water is good for you and your horse. Many people go to water their horses from the lake at the boat landing. Otherwise, I plan to bring my barrel of water to share for the horses. It will be on the back of my truck. WEATHER: I am ambitious about riding and camping whatever comes, but if we have to cancel due to horrible weather, I will send notice by Thurs 8pm EST. LOGGING ON THE TRAIL: There is logging activity on FR1841. That is the leg of the trails east of Courtney Lake. So, that area should be avoided. There are still plenty of trails to enjoy. RIDING SOUTH OF THE FIRESTEEL RIVER: There is no river crossing, but have you ridden south of the Firesteel River? A small rig would fit on the entry point off of Dishneau Road. No space to turn around, but a nice ride. Ambitious riders have ridden there along the roadsides, though there is not much of a shoulder on the Dishneau Road. The trail entries are about 1 1/4 mile from highway M38. Until there is a river crossing, most people stick to the north side of the river. RIDES & SUCH (set at EST) : Friday 1pm – Ride / 5pm-ish eat (bring your own meat & beverage and a dish to share) / Evening ride anyone? MAPS: go to mi-trale.org click on the EQ page, and on the map link. Print at will. I will bring extra maps also. It is always a great day for me to work and/or ride out there. Thank you for your continued support for the Courtney EQ Trails.